To get the full effect, press play on the track above and start reading. This post is a more in-depth commentary following our announcement yesterday that Referly will discontinue paying users cash rewards for generating purchases at the end of this month. Referly has pivoted and you can read more about our new direction here. It can take a long time to die. I’m not going to name any names, but you could simply cross reference yclist.com with alexa.com, and any company that shows little to no growth in web traffic in the past year that claims to still be operating is probably a zombie. Yes, even companies that focus on mobile or enterprise sales should see healthy growth in web traffic at the early stage. With just the $150,000 each of my Y Combinator batchmates received last summer, many can continue to work on their company or change direction several times. It has been 6 months since Demo Day and I don’t think anyone has officially died. So I’ll say it. Referly died. It’s not the kind of dead where the website goes dark and everyone gets jobs somewhere else. But the idea that we started with turned out to be the wrong one, so we killed it and yesterday I acknowledged publicly to ourselves and everyone else that we have to change our course. Sometimes I feel caught between two mindsets, one that encourages me to be a cockroach and survive no matter what and another that inspires me to overcome my fear of flying and take it to the next level circumstances be damned. The biggest reason to charge ahead is that I don’t want to waste a single moment of my life in denial, in deadlock, in zombie mode waiting for something I can’t control change or expecting magic to happen. It goes beyond not wanting to. I simply can’t, won’t, would never give up precious days, weeks, months, years. And it’s not that I don’t have endurance for the schlep, but I can only summon that super-human power to fight for the right thing. 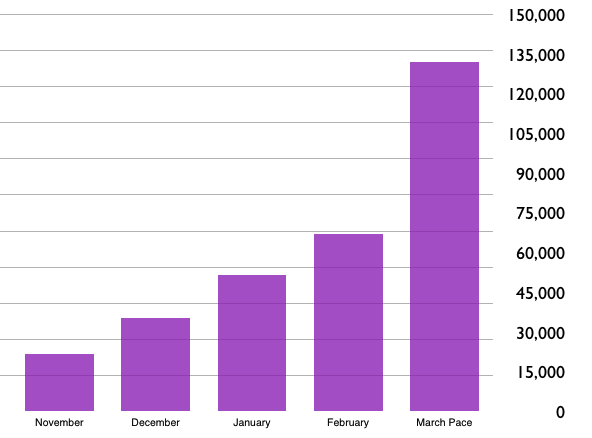 I bet if you showed this graph to investors many would tell you your startup is doing GRRRRRRREAT! For a blogging platform (where we’red headed next) this is awesome – for an affiliate referrals site this doesn’t matter. It’s all about revenue, and it wasn’t climbing at a commensurate pace. Update: I’m not saying you need to hit 10% growth every week, but you should have hit it at some point like launch or some other PR event. Does any of this sound familiar? If so, don’t panic – you can fix this. The first thing you need to do is acknowledge the reality of your situation. From there, figuring out what to do next is a lot harder and a very personal and contextual decision, but you should embrace it with vigor. Don’t waste single moment of your life, or the time of those on your team, to begin plotting the next step. Paralyzed? Yeah, I know that feeling. Just plow through it, there really is no other solution. Along the way you may consume dozen of beers/shots with good friends over long circular discussions they tolerate because they love you. Do that, and then get back to work. I’m not an expert at figuring out what to do next, I mean I just changed course on an idea that took me 3 years to start and another year to prove didn’t work. But whatever… the point is that no one is going to tell you that your company is a zombie. Except me. Don’t waste your 20s, or 30s, or 40s being a zombie. Flame out hard. That’s my only backup plan, because doing the silent fail is for boring. Failing is failing – do it up right!